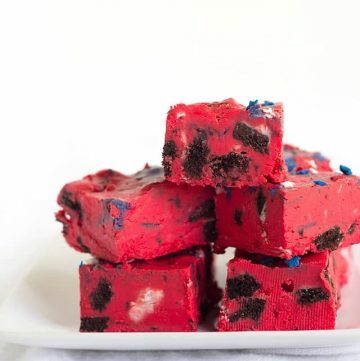 This oreo frosting fudge is so simple to make. It’s red, white, and blue and perfect for the 4th of July. 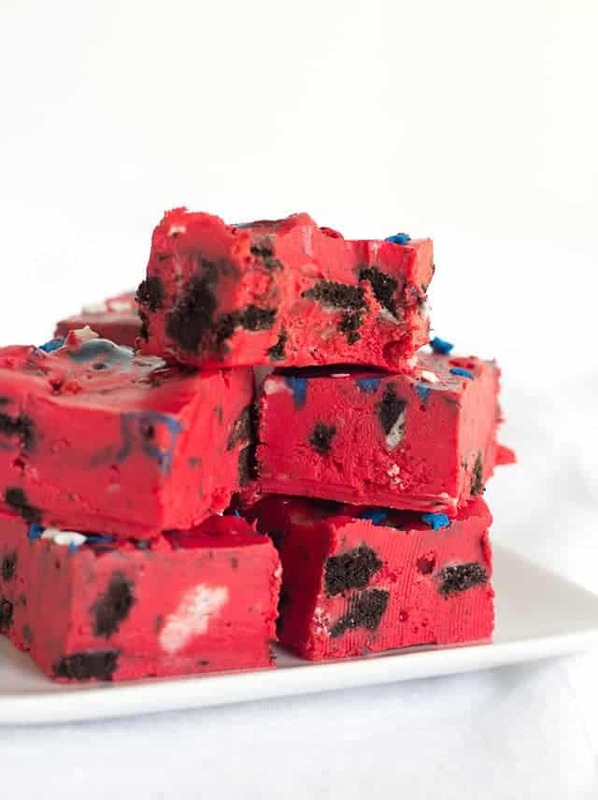 The crushed up firework oreos have a pop rock filled frosting that pops in your mouth when you eat the fudge. Kids go crazy for that! Happy July 4th, friends! I’m always throwing sweet treats together JUST before a party because I’m a last minute kind of gal. That means I need to have an arsenal of quick and easy recipes on hand to make. It doesn’t get any easier than this. Seriously. I wanted to create this recipe because I got sucked into the firework Oreos that I saw at the store. My husband and I were talking about using pop rocks in a cookie recipe and I swear the next week these oreos came to my local Walmart. In the meantime, I had tried to use pop rocks in a cookies recipe but they don’t hold up to the heat. So yeah, I knew I had to buy some of these sandwich cookies and make something that could be no bake so the little pop rocks inside of my cookies didn’t melt. It hit me that we could do a shortcut fudge using store-bought frosting and white chocolate chips. The frosting was already colored red and blue so that was a huge bonus. There are two things that really bring this fudge to life. The blue frosting swirled into the top of the fudge and the red, white, and blue star sprinkles that I added to the top. I swear I almost threw out this fudge solely because I thought it was going to be ugly. Boy was I wrong. Where’s my eye roll emoji? That’s my favorite emoji to use on my phone followed by the smiley face with the heart eyes in a close second. Do you need more fudge? 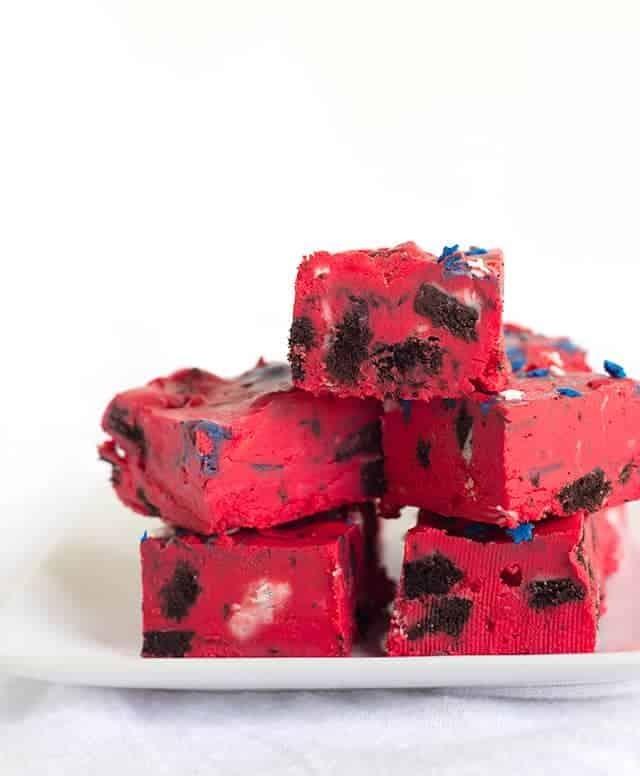 The red, white, and blue oreo frosting fudge is so quick and easy to make. It has 5 ingredients and only takes minutes to come together. 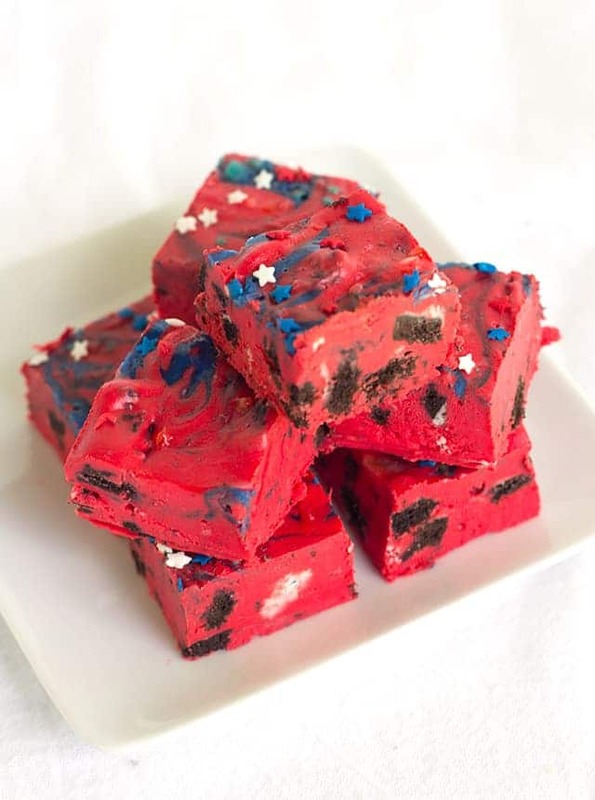 PLUS, this fudge will bring life to your party! Line an 8x8 pan with tin foil. Spray with cooking spray. In a double boiler, melt the white chocolate chips. It will take a few minutes. You can also microwave the white chocolate chips in a microwave-safe bowl for 30 second intervals and stirring after each time in the microwave until the chips are smooth. Add the red frosting into the white chocolate chips and stir until thoroughly incorporated. Pour the fudge into the prepared pan and spread evenly out. Add a drizzle of blue cookie to the top of the fudge, working quickly. Using a toothpick or skewer, run it through the blue and red to swirl it together. Tap the dish out to help smooth out the fudge. Add sprinkles to the top of the fudge. Chill the fudge until it's completely firm. Cut into small squares.